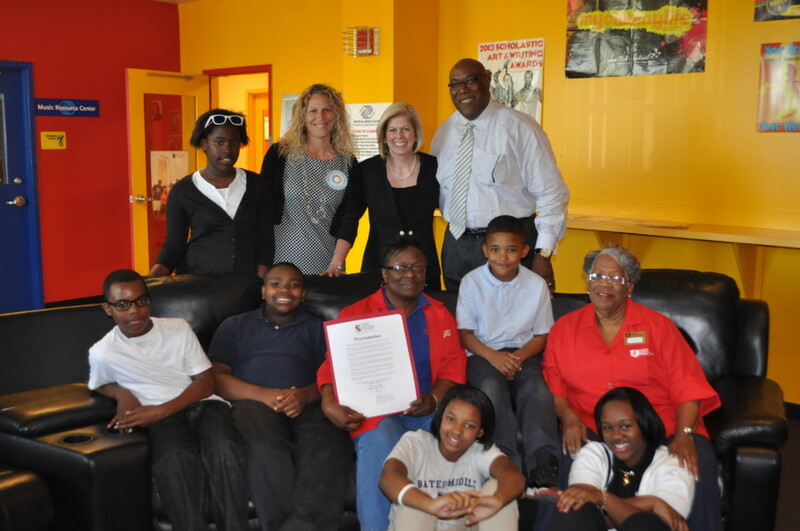 Anne Arundel County Executive Laura Neuman honored the Senior Corps Foster Grandparent Program (FGP) with a Proclamation at the Boys & Girls Club of Annapolis and Anne Arundel County. Barbara Jean Butler of Annapolis and Carol Jones of Arnold received the Proclamation on behalf of the 56 FGP volunteers from Anne Arundel County. Senior Corps Week celebrates the extraordinary impact of volunteers and recognizes community partners who make this program possible. This week-long recognition shines a spotlight on how volunteers employ their wisdom, specials skills, and experience to strengthen communities. FGP volunteers provide one-on-one attention to more than 300 young people in Anne Arundel County. “FGP volunteers work to improve the academic performance, self-esteem, and overall social behavior of these children, and we are grateful to have them in our lives,” said Kristin Plumer, FGP Director. Last year FGP volunteers provided over 51,000 hours of service at Boys & Girls Clubs, Head Start Centers, Public Schools, Special Education Schools, Department of Recreation and Parks summer programs, and the Department of Social Services Family Support Center. In addition to helping others, older volunteers are also helping themselves by living active, healthy lives through volunteering. By highlighting Senior Corps Week, we hope to inspire others to get involved. Foster Grandparent Program volunteers must be 55(+) and income-eligible (making less than $22,980/single person and $31,020/family of two). Benefits include: a modest TAX-FREE stipend, paid training, vacation and sick leave, transportation, annual physical exams, and recognition events. For more information on how you can get involved in making a difference, contact the Foster Grandparent Program at the Anne Arundel County Department of Aging and Disabilities at 410-222-4464.